• Raise the Age in NY -- Now What? Raise the Age in NY -- Now What? Approximately 50, 000 16- and 17-year-olds in New York state, are arrested and face the possibility of prosecution as adults in criminal court each year — the vast majority for minor crimes. After months of incredible advoacy efforts from organizations and supporters, Gov. Andrew Cuomo and legislative leaders were not able to pass Raise the Age legislation, but instead, announced a broad package of agreements on everything from rent regulations to school funding to criminal justice reform. New York is still one of only two states in the country that have failed to recognize what research and science have confirmed – adolescents are children, and prosecuting and placing them in the adult criminal justice system doesn’t work for them and doesn’t work for public safety. We need legislators to support the proposed legislation which includes a number of critical reforms that will reduce recidivism and ensure that children receive age-appropriate services or incarceration. Raising the age will not only produce better outcomes for New York’s youth, but has also been proven to better protect public safety with multiple studies showing that youth who receive age-appropriate services are less likely to re-offend. Now we need YOU to help make this a reality. 1. Fill out this quick Action Alert to let New York State Legislators know you want them to Raise the Age in this year’s budget (no matter where you live and who represents you, we want this urgency getting to the sponsors). Lobby Days and Hill events are taking place all throughout the month of March in New York. If you're a NY resident, here's how you can participate in person or online. Times Union "Advocates Urge Age Change"
State of Politics "Coalition Pushes To Renew Raise The Age Debate"
The Legislative Gazette "Tragic Stories Show Need to 'Raise the Age' of Criminal Responsibility"
Syracuse "NY budget includes $135 million for 'Raise the Age,' with policy to come later"
Herstory Workshop Writers Workshop shares powerful stories from young people about their personal experiences with the system. And in the "more than you ever wanted to know" category, full text of the Commission report and a list of recommendations. 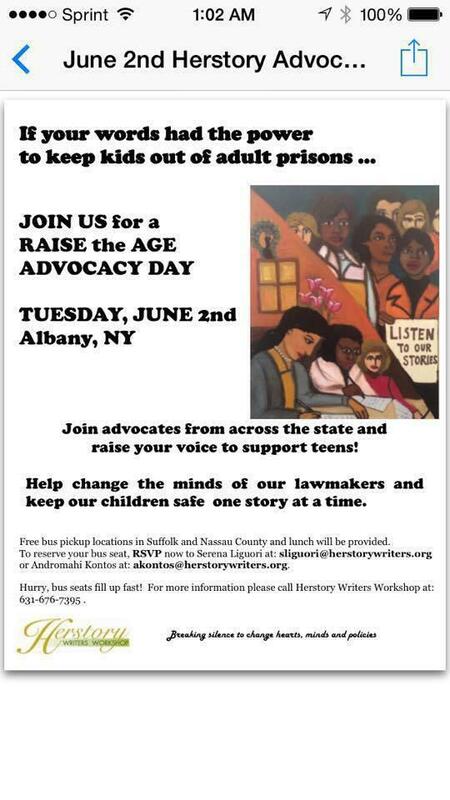 Stay up to date on the Raise the Age campaign with the Raise the Age New York page.